UN judges have sentenced former Bosnian Serb political leader Radovan Karadzic to life in prison on appeal, ending one of the most momentous trials over genocide committed during the Balkan wars of the 1990s. They upheld Karadzic's conviction for the 1995 massacre of 8,000 Muslim men and boys at Srebrenica and ruled the 40-year sentence imposed at the close of his trial was too light, given the immensity of the crimes in question. Survivors erupted into applause after Presiding Judge Vagn Joensen read the final sentence, which cannot be appealed. Karadzic, who had argued the court was biased against him, stood impassively. The sentence was fitting given the "extraordinary gravity of Karadzic's responsibility and his integral participation in the gravest of crimes committed throughout the entire area of the conflict in Bosnia," Judge Joensen said. 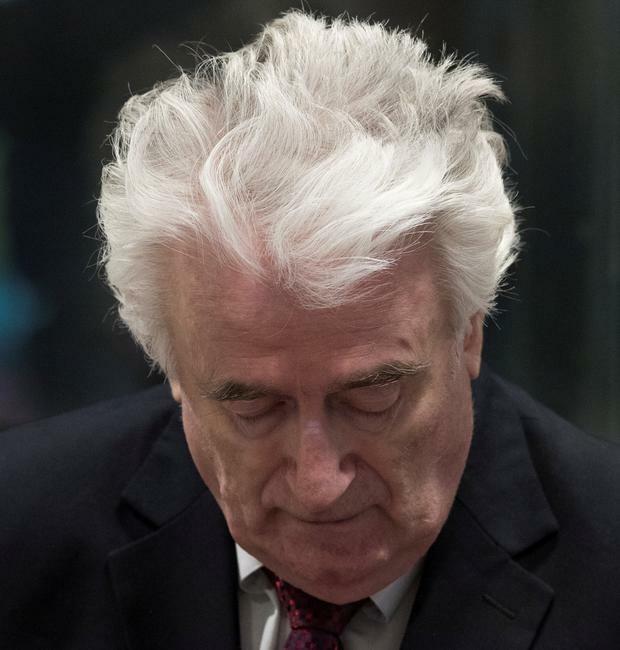 Karadzic (73) was convicted in 2016 for the genocide at Srebrenica. He was also found guilty of war crimes and crimes against humanity for the 44-month Serb siege of the Bosnian capital Sarajevo that terrorised the civilian population, and for overseeing a campaign of ethnic cleansing that drove Croats and Muslims out of Serb-claimed areas of Bosnia. On appeal, prosecutors had sought a life sentence and a second genocide conviction for his role in ethnic cleansing. Judges rejected the request for the second genocide conviction, but upheld his conviction on all other war crimes and crimes against humanity charges, including persecution and murder. "I am partially satisfied but a bitter taste remains that the Hague tribunal could not convict him on the second genocide charge, because of international pressure protecting the interests of Serbia," said Mirsad Duratovic, a former Bosnian Muslim prisoner in three Serb-run detention camps in the town of Prijedor during the war. "I cried because I lost my children, I am all alone," said Mira Dogas of the Mothers of Srebrenica group, who travelled to the Netherlands for yesterday's verdict. "I am very shaken. I lost three sons, my husband, my grandchild, my father died," she said. "He's still alive while our children have been in the ground for a long time and they had a horrible death." Karadzic's lawyer said he would continue to consider ways to look for a judicial review or having the sentence commuted. "He says that if the choice to have an independent (Serb republic in Bosnia) meant that he had to lose his freedom he's prepared to make that choice and lose his freedom," Peter Robinson said outside the courtroom.